"Destroyer -- 1917 Bldg. Program ... Sept. 1915"
Preliminary design concept prepared at the time that the General Board was developing the characteristics to be sought in the Fiscal Year 1917 destroyers, which became the Wilkes (Destroyer # 75) class. 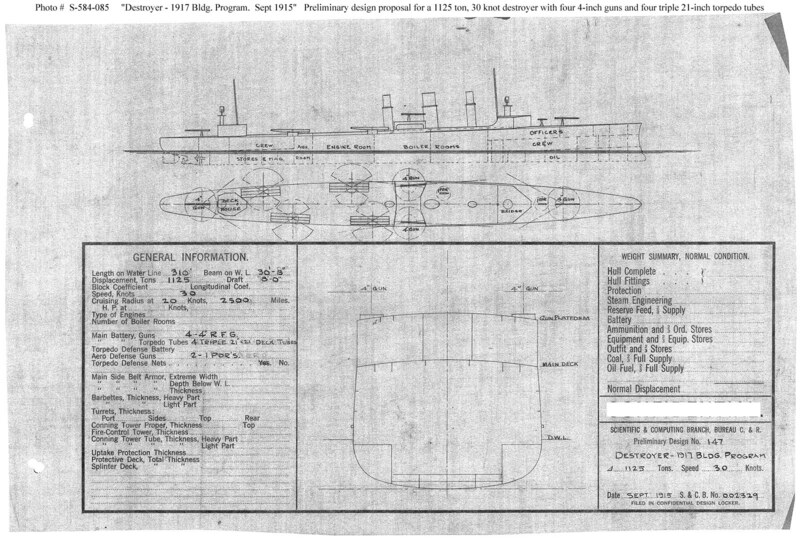 This plan provides four 4-inch guns and a speed of 30 knots in a ship 310 feet long on the load water line (L.W.L. ), 30 feet 8 inches in beam, with a normal displacement of 1,125 tons. The design closely followed that adopted for the previous destroyers of the Caldwell class (Destroyer #s 69 through 74), which included provision of a ram bow for attacking submarines. The ram bow was dropped from the Caldwell class prior to construction and omitted in the subsequent preliminary design (see Photo # S-584-101) for the Wilkes (Destroyer # 75) Class.